Time for a road trip? The cool climate near the ocean produces wines similar to Northwest varieties. 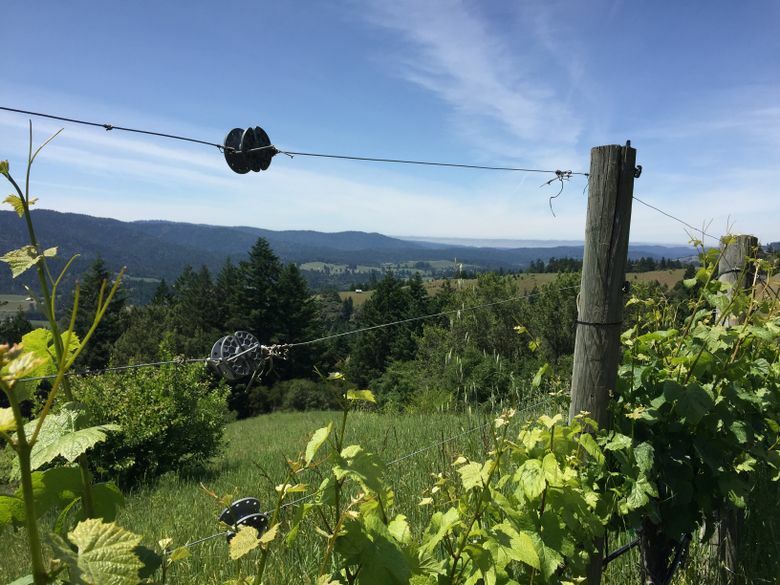 ONE OF THE most beautiful off-the-beaten-path and underappreciated wine regions on the West Coast is the Anderson Valley in California. Located just north of Sonoma County in Mendocino County, Anderson Valley combines incredible wines with breath-capturing natural beauty. Just off Highway 101 at Highway 128, a drive into the Anderson Valley feels a little like you’re heading into Sleepy Hollow. But once you reach the town of Boonville, you’re in this beautiful valley that stretches all the way to the Pacific Ocean, some 20 miles to the west. These wines using Anderson Valley grapes should be available at better wine shops. Can’t find them? Just ask, as all have Northwest distribution. No luck? Call the winery to order directly. Roederer NV Estate Rosé, Anderson Valley, $28: Aromas of fresh-baked bread and a hint of cherry lead to refreshing flavors of raspberry backed by bright sparkle, with a satisfying finish. Goldeneye 2012 pinot noir, Anderson Valley, $55: This is a bigger, more-focused and more-concentrated style of pinot noir than one might find in Oregon or even Russian River. Notes of cocoa powder and Rainier cherry and hints of rhubarb give way to gentle tannins. Navarro Vineyards 2015 gewürztraminer, Anderson Valley, $20: This is the gold standard for American gewürztraminer, and it delivers classic aromas and flavors of tropical fruit, including lychee, pink grapefruit and clove, all backed by surprisingly firm acidity. The perfect Thanksgiving wine. Surrounding the towns of Boonville, Philo and Navarro are tall trees and vineyards growing such cool-climate grape varieties as pinot noir, riesling, pinot gris and gewürztraminer. It feels as if you’re winding your way through the Olympic Peninsula around the Hoh Rain Forest. This might be the coolest wine region in California, which means the wines are much more like what we’re used to in the Pacific Northwest, where acidity and balance are the norm. This could be considered the opposite of the warm and ripe Napa Valley. There is a lot of great history in this little valley, including its own language, called Boontling, which developed in the 19th century around the town of Boonville. It’s also home to about 60 wineries, including a handful of sparkling wine producers who take advantage of the cool-climate viticulture. With all the wineries and amenities along Highway 128, which bisects the valley, it’s nearly impossible to get lost while touring the region. Be aware that there are few hotels and restaurants, but there is a handful of B&Bs and Airbnb options, as well as a few solid restaurants, led by the Bewildered Pig in Philo. There also is a handful of microbreweries. Anderson Valley is a beautiful 13-hour drive from Seattle for those looking to take a leisurely vacation down the Oregon Coast and through the Redwoods. It’s also a two-hour drive north of San Francisco and a little more than an hour north of Santa Rosa.